One of the things that you first notice when you start camping a fair amount is just how much time we all spend sitting when we’re at home. And when you’re out camping, unless you bring your own chair, there really isn’t anywhere comfortable to sit for long periods of time. Your options are basically to sit on a rock, a log, the ground, or your tent floor (the ground). The good news is however, that there are lots of great camping chairs on the market. They come in all designs and sizes, so you can get a chair that fits you best. If you’re looking for a camping chair with a cooler, you are in luck. There are a handful of really great options. 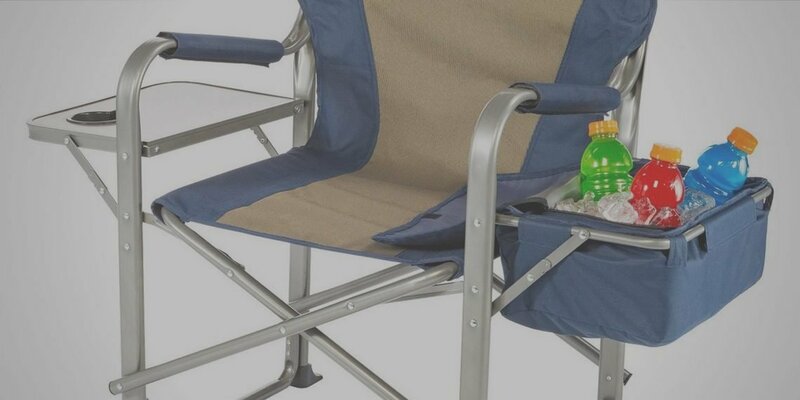 The nice thing about camping chairs with coolers is that they work perfectly for soccer games, tailgating, the beach, the fireworks, or anything else. This one was an easy choice for us. The Coleman Quad Chair is durable, affordable, and transports nicely. It’s just a really sturdy basic camping chair, that also has a convenient little cooler. It’s oversized dimensions make it extremely comfortable for anybody to relax in. The seat is 37 inches wide, and 27 inches deep. It has a steel frame and solid construction, with a weight limit of 325 pounds. The cooler pouch itself holds 4 drinks. What we like about this is that it’s not too big to keep the chair from folding down and carrying in the sack, yet still sized appropriately for an afternoon of good times. Package all this up in a price point that’s right around $30, and it’s easy to see why it has over 4,000 positive reviews on Amazon. Keep doin what you do, Coleman Quad! If you’re looking for a camping chair with a cooler AND table, then you should buy the Kamp Rite Director’s Chair with Side Cooler and Table. This chair has a moderately sized cooler compartment on the left armrest, and a small end table with cup holder attached to the right. We like it because it’s perfect for eating in front of the campfire. If you need to move something or add wood to the fire, the little table allows you to set your food down and free up your hands. The cooler is fantastic–big enough to hold a 12-pack….. of soda? (Tommy Boy anybody?). This is a good and bad thing though, because you might suddenly become more popular than you wanted! All in all, a great chair. Collapses nicely for carrying. It weighs 13 pounds, so it ain’t exactly a featherweight, but it does have a really sturdy construction that can support up to 325 pounds. We approve! Here’s one you’re not expecting… we haven’t actually found a double camping chair with a cooler that we can recommend. Most of these on the market today are cheaply made and awkward to use. Instead, we recommend that if you want seating for two, you just score yourself 2 of the Coleman Quad chairs (above). They after do sell them in a 2-pack, so you can save a few bucks that way. Don’t get too excited though, depending on Amazon prices, it’s literally like $2 to $5 (still, it’s something right?). p.s. If you know you’ll be using your camping chair for a lot of tailgating, you can also get the Coleman Quad with your favorite NFL logo. Represent! At the end of the day, a camping chair is something to help you get outdoors for both fun and relaxation. And relaxation should really be the ultimate benchmark–how much can you relax when you are sitting in it? Our picks are exactly that for us, and we hope you enjoy them too. Happy camping!